Monte Cristi is a province in the north-west of the Dominican Republic. 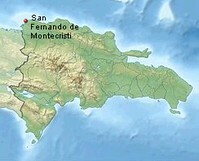 The capital city is San Fernando de Monte Cristi (usually simply Monte Cristi). The spelling Montecristi is also seen. Monte Cristi, located approximately 135 km west of Puerto Plata, sits among desert-like surroundings on the northwestern tip of the Dominican Republic. Founded in 1506, the town was an important trading port until the 19th century - exporting sugar, mahogany and other crops to Europe. Presently most of the 36,000 inhabitants make their living from farming, fishing and the salt flats to the north. There is not a lot of tourism in this Victorian-style town, but those that visit can enjoy Cayo Cabrita and El Morro beaches, as well as very good diving. From El Morro you can swim 300 meters out to Isla Cabrita, an island housing a lighthouse. Divers enjoy investigating the several shipwrecks, which include colonial-era galleons. Many come to the area to visit the National Park, Parque Nacional Monte Cristi, consisting of subtropical dry forest, lagoons and a 900 foot high table-mountain, El Morro. This table-mountain overlooks the spectacularly clear sea below and several small islands located just off shore, known as Los Siete Hermanos (The Seven Brothers), where large sea turtles lay their eggs. There are over 160 species of birds and over 10 species of reptiles that occupy the park. The people of Monte Cristi are a big celebrators of Carnival, the days leading up to Easter Sunday, and May 30th, the Patron Saint festival in honor of San Fernando.